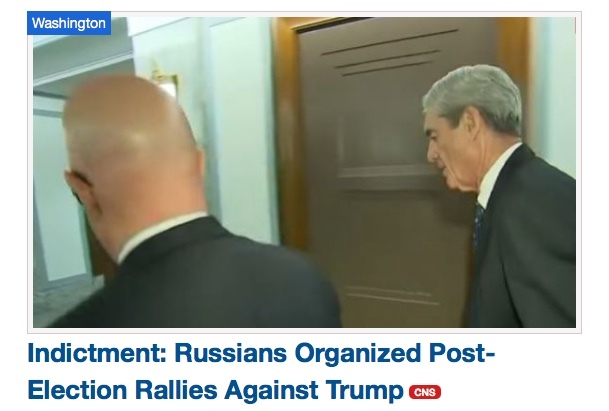 After last week's indictment of 13 Russians for interfering in the 2016 presidential election, mostly for the benefit of donald Trump and aagainst Hillary Clinton, CNS published three aricles about it -- all of which manage to avoid stating in the headline the salient fact that Russians interfered in the election to benefit Trump. All three articles were written by CNS editor in chief Terry Jeffrey, so this blatant pro-Trump spin is coming straight from the top. And, of course, there's the requisite uncritical stenography of Trump's tweets on the issue. This is the standard M.O. for CNS -- avoiding reporting of the actual news in favor of cherry-picked information favorable to conservatives (and, in this case, the Trump administration) that it can blow up and get links from the likes of the Drudge Report. That also means there's no highlighing of minor information that makes Trump and conservatives look bad -- like the fact that the indictment also revealed that the Russian trolls heavily promoted baseless right-wing fears of voter fraud in the election. That's how committed CNS is to biased reporting.